Fluttering Butterflies: I love you, guys! There's lots of positivity in the UK book blogging world right now and I think that's fantastic. Inspired by the blog posts I've seen from Laura, Carly, Kirsty and Jo, I thought that today I would talk a little bit about it as well. Recently, I found out that I had been long-listed in this first ever author and publisher-led UKYA Blogger Awards. The day it was announced I spent a great deal of time staring at my laptop screen, looking at the nominees page and seeing my blog's name there but not really believing it. Then I went on to Twitter and I saw loads of people talking about it and congratulating other bloggers about it. And I cried. I did. For about an hour. What an honour. I called up N at work and I was an emotional wreck and he kind of laughed about it because at the best of times I'm an emotional wreck. And maybe another time I'll talk about what this really means to me. But for now, hurrah! There are very few things better in my life than being involving in the book blogging community. As, I think, it shows by the response that both the Blogger Awards being held right now have had. There's been an outpouring of love and support for both the book bloggers nominated so far and also for all book bloggers generally. For the hard work and dedication and enthusiasm that we all pour into our blogs. I think it's really easy to fall into the mindset that what we do as book bloggers doesn't really matter. I've had those doubts. Those thoughts that tell me that I don't have much influence on other people, that if anything I'm only selling books to other book bloggers. The idea that because I'm writing on my own, on a blog as a hobby and not for a proper media outlet that what I write is somehow less meaningful or important or impactful. It's easy to think all of those things and then believe that they're true. But I don't think that they are. And having an author and industry professional led awards does help somewhat in burying those thoughts. I started blogging 9 years ago. And while it wasn't specifically a book blog at the very start, that was only because I hadn't heard of such things (and wouldn't hear the term 'book blog' for several more years). I was still talking about books even when this wasn't a book blog. I was sharing my experiences of spending all day with my favourite book or showing you my library hauls. And then over time, it changed. And things are always changing. I've been lucky enough to be involved with lots of authors and publicists and to be invited to events and I've met a fair few other bloggers. And it's always amazing. And the UKYA blogging community is only growing. I follow more new-to-me bloggers than ever before both in my feed subscriptions and on Twitter. And while at one point I could go to a blogger event and know everyone ... lately I've seen new faces pop up. And that too is incredible. Because new bloggers bring new perspectives and new creativity and ideas and passion. And everyone that I've met is so friendly and welcoming anyway! There's room for everyone in this community. Whether you're old like me or just starting out. What I love so much about UKYA book bloggers as well is that we're so diverse and have so many different talents and passions. Every time that I turn on my laptop and go blog hopping I'm amazed. I'm amazed by at the amount of thoughtful, in-depth reviews. And by the humour and playfulness of different posts. By the creativity of creating infographics and other graphic design marvels. Or interesting new features or create forums or YouTube videos or entire awards for books/authors/bloggers or organising spreadsheets or regular meet ups or Twitter chats. I'm amazed by the focus that some bloggers have for specific topics like bullying or celebrating diversity. By the call for social change. I'm amazed by the people who are scared to talk about important things and do it anyway: your courage and honesty paves the way for the rest of us. I'm amazed by the sheer amount of blog posts written every day. All in support of books and authors and about reading and sharing. You guys, you're all amazing. Every one of you. I'm honoured to be part of a community that recognises the power of books and storytelling and not only sees this but takes it a step further by writing about it and promoting and supporting it. 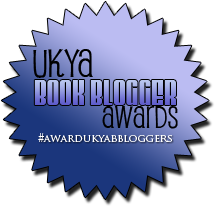 I'll leave the links below for the both blogger awards going on at the moment as well as to some blogger posts about the UKYA book blogging community.